The oxides of silver (along with cadmium) are of interest as they show an anomalous negative binding energy shift compared to the metal. 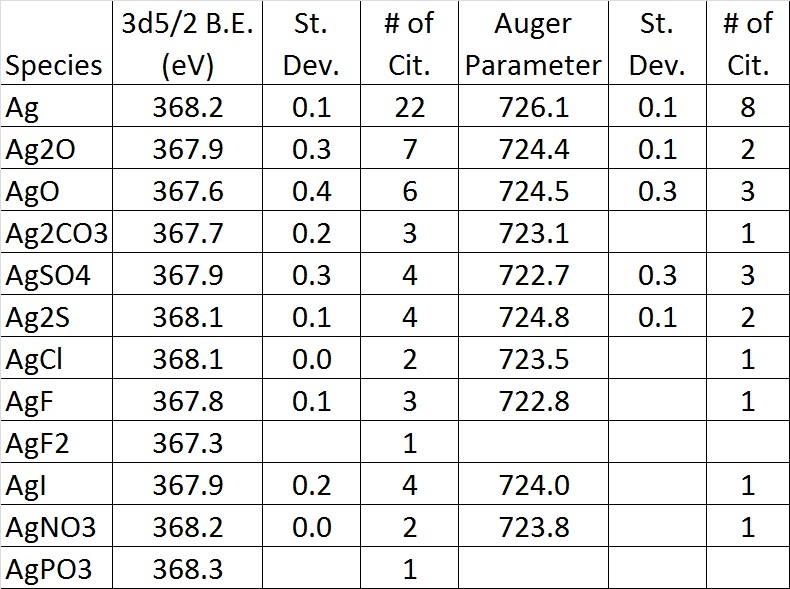 For Ag2O and AgO the shifts are approximately -0.3 eV and -0.8 eV (see Table 1). The predominant cause of this peculiar shift (according to ) is due to initial-state factors of ionic charge and lattice potential. 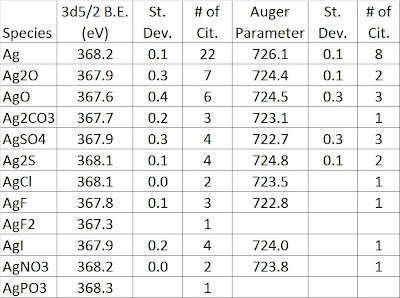 It should be noted that both binding energies and Auger parameter values for Ag2O and AgO are quite similar, making species identification of the oxides in an unknown sample quite difficult. Table 1. Ag 3d/52 binding energies and Ad 3d5/2 - Ag M4N45N45 Auger Parameters in eV . Figure 1. 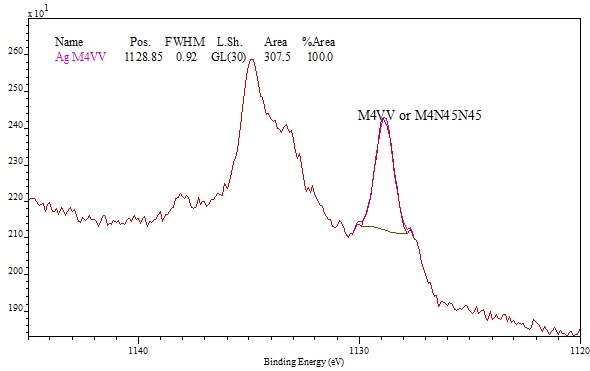 Ag MVV Auger spectrum showing location of the M4VV or M4N45N45 peak used for Auger parameter analysis. .D. Wagner, A.V. Naumkin, A. Kraut-Vass, J.W. Allison, C.J. Powell, J.R.Jr. Rumble, NIST Standard Reference Database 20, Version 3.4 (web version) (http:/srdata.nist.gov/xps/) 2003.